Virtual CdA is a Premium member benefit. Unlocking this feature gives you an estimate of aerodynamic efficiency on Activities and Segment efforts. Virtual CdA is available on all activities and segment efforts that have power meter data. CdA is drag coefficient multiplied by the area of a moving object. By lowering your CdA you can attain greater speeds for the same power input. Lowering your CdA will also dramatically reduce the affect of the the wind on your speed. What is myWindsock Virtual CdA? There are two choices of how your CdA is calculated. Dirty and Loops. By default your forecasts use the Loop* method of determining your ride’s average CdA. Using the data from segment efforts and activities it is possible to estimate the aerodynamic efficiency of the rider. To produce a Dirty Virtual CdA the following data is required: weather; elevation; speed and power. 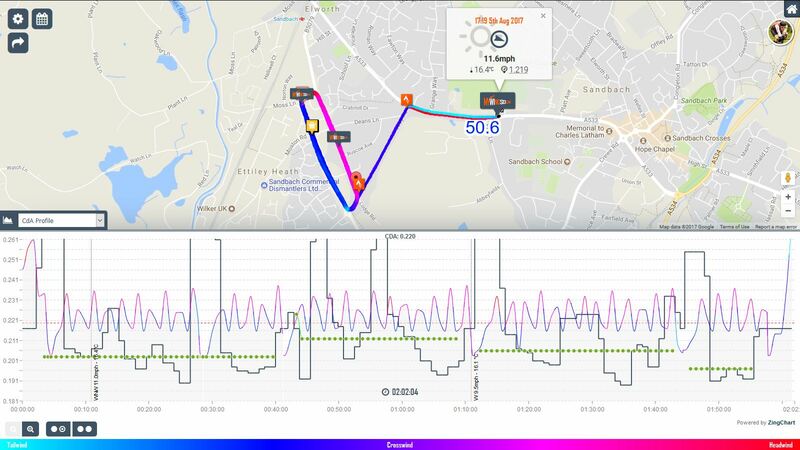 Using your estimated air speed combined with a number of variables including your power, speed and gradient we can estimate how efficient you were at moving through the air. Many things can affect the calculation of your CdA. Consider accelerations and deceleration, braking for junctions, a butterfly flaps it’s wing in Japan, pot holes! To produce a meaningful CdA we attempt to filter out these moments. Ride normally to collect a few rides with your normal position. Use a similar route each time and at least 5 miles, longer the better. Make a change to your position. Ride in the new position for a few rides. Again similar routes. Compare the CdA numbers for your rides. Is the trend downwards or upwards. If the CdA has gone down the change was positive. If you CdA has increased revert to your original position. The Loops CdA option is intended for aerodynamic field testing where a single loop is repeated multiple times. The myWindsock field testing functions are designed to make this process as easy as possible and has the ability to pick a winner in your A-B testing. Tests are detected and poor loops removed. Choose a location that you can safely complete multiple loops without changing position or having to use your brakes. The loop can be any size, choose a loop that you can complete at least 5 time per test run. Pick a day in where wind speeds are low and in particular low gusts. myWindsock factors in wind speeds adjusted for wind shear/gradient however gusts will affect the quality of your results. Better a high average and low gusts than low average and high gusts. Decide what you are testing and change only that one variable between tests. Complete a test run of at least 5 loops. By default only the middle 3 loops of a 5 run test will be counted. Do not change anything. Repeat the same test. Repeat the loop again, at least 5 times. Heavy braking or dragging of brakes. Although myWindsock attempts to remove braking events from your CdA estimate to improve the quality of your estimate avoid courses that require the use of your brakes for the best estimate. Poor elevation data. If your elevation data is incorrect the match between power and speed will be incorrectly calculated. 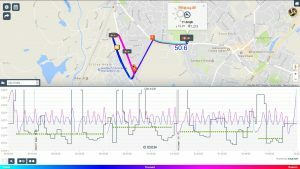 Often using the Strava Correct Elevation function will improve this and add consistency to your calculations. Incorrect weather observations. The observed weather improves over time. For the purpose of CdA estimation you may need to wait a few days for the most accurate weather data to be confirmed. Bad power meter data. It is wise to check the drift in your power meters offset before and after testing. A large change in offset is a sign that the power data is not of sufficient quality for accurate estimate of CdA. Drive Train Loss. A dirty drive train, rubbing brake, bad wheel bearings are all sources of power loss from a crank based meter to the actual power output. If these variables change the CdA can be incomparable between estimates. Incorrect Wind Shear selected. If the wind speed is not correctly adjusted for the environment you are riding errors of wind speed will impact your CdA estimate. Long rides provide better estimates for CdA as the average is taken so fluctuations due to changes in wind shear are negated. Paying attention to the above will drastically improve your CdA estimate. Your efficiency at moving through the air is a combination of your bike position, clothing and equipment. For example as soon as you put on a rain jacket your CdA will increase and you will go slower for the power. Your CdA should be viewed in context, a road bike position is less efficient than a time trial position. Wearing an aero helmet is more efficient than a standard road helmet. 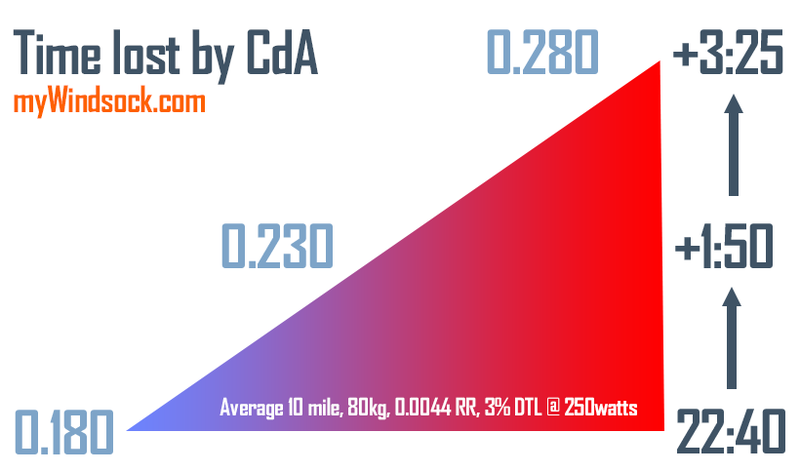 Time trialists can aim to have a CdA below 0.2, however this is by no means the average which is closer to 0.22-0.23. A road bike racer can be as low as 0.24 but the average is closer to 0.27. A regular road bike and standard helmet in the summer is likely to be 0.3-0.32 however in the winter this can be much higher. A performance cyclist should pay continuous attention to their aerodynamic efficiency. So whatever your current Virtual CdA you should attempt to lower it. It is in most cases more important than losing weight, although losing weight is also a good way to reduce your drag. That said, a beer belly is apparently more aerodynamic than a flat stomach! How do I improve my CdA? Instant improvements can be found by spending money on equipment. Deep section wheels, aero helmets and aero bike frames all drastically lower CdA. The biggest improvement you can make is your position and in the main achieving a better position is free. Improving your position takes time and attention. Tidy cables, cut them to an appropriate length. No gloves unless aero gloves.